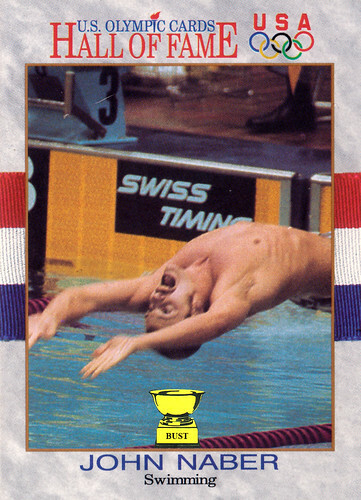 They call him The Streak: John Naber won four gold medals at the 1976 Summer Games, all in world record times. But just how fast was he? John Naber was so fast, cameras were unable to capture him in focus. He was so fast, even his sideburns couldn't keep up with him. He was so fast, this card could only show him from the waist up because his suit was falling off. He was so fast, he couldn't keep his mouth closed. He was so fast, he didn't have time to spell "neighbor" properly. John Naber was so dang fast, he could swim the English Channel, the Panama Canal and the Mississippi River in the time it takes you to wash your hands. You do wash your hands, don't you? Heathen.